Marty McFly and The Dude are coming back to movie screens starting next month thanks to the Downer. Published March 16, 2018 at 3:01 p.m.
Get ready to lose sleep but win at life. The Downer Theater has announced the lineup for its first ever Almost Midnight retro movie series, a collection of late-night legends, cinematic classics, horror icons and cult films coming to the East Side theater on Friday and Saturday nights at – you guessed it – midnight (or at least around it; any midnight movie veteran knows it can take a bit to load all those caffeinated cinephiles into the theater). The film festivities will start with the Coen Brothers' ultimate cult classic "The Big Lebowski" on Friday, April 20 (well played, Downer) and Saturday, April 21, before bouncing around from Hitchcock to "Here's Johnny!" to Harrison Ford and an impressive deep cut horror pick of Dario Argento's "Deep Red." (Impressive work, People In Charge Of Organizing This.) The series will then come to a close in the middle of summer blockbuster season with one of the best blockbusters ever made, "Back to the Future," on June 8-9. 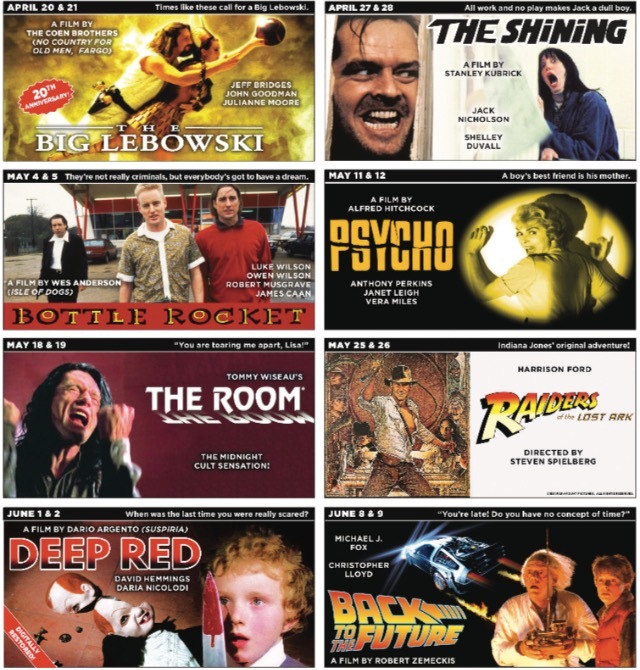 April 20-21: "The Big Lebowski"
May 25-26: "Raiders of the Lost Ark"
June 8-9: "Back to the Future"
For tickets, visit the Downer's website.